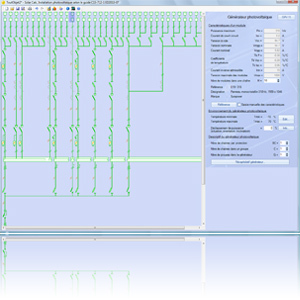 archelios Calc™ is a complete solution for calculation, sizing and checking of photovoltaic installations connected to the public network according to the C15-712-1 guide. As a specific professional tool designed for photovoltaic installers, archelios Calc™ takes into account all types of PV installations entirely: from the photovoltaic panels to the inverter and from the inverter to the network. archelios Calc™ presents a complete and global view of the photovoltaic installation, from the photovoltaic modules to the connection to the public power supply network. archelios Calc™ is a solution which ensures optimal security with real time photovoltaic calculation of the installation and its control according to the NF C15-712-1 and the IEC standard .